All power to your pen if you’re taking part in National Novel Writing Month and attempting to write 50,000 words of a novel during November. I won’t be taking part myself although I love the idea of sitting down at my computer and bashing out 50,000 words of prose. I love the idea of a project – I love projects – the idea of doing something, every day, and owning a tangible product – a 50,000 word manuscript! – to hold in your hands at the end of it. I realise that, in the majority of cases, this weighty manuscript will be the start and not the end of things but I still admire anyone who sets out with the ambition, drive, energy, hope, and enthusiasm to achieve something to do with writing. 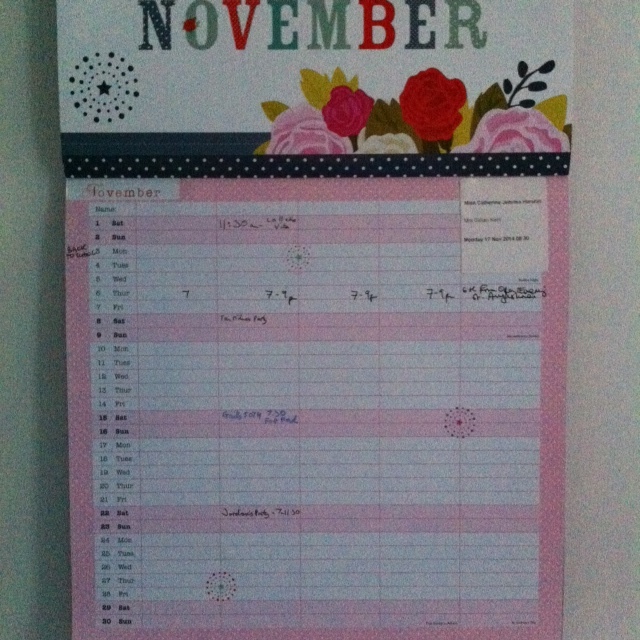 Perhaps the biggest problem of #nanowrimo, for me, is the time frame. It’s unlikely that I could achieve a goal of 1,666 words a day for 30 consecutive days. My life is too busy and too multi-faceted, at this time, to be able to do this and I would be setting myself up for failure. I don’t want to feel like a failure! But I think it is good idea to set yourself goals if you want to achieve something with your writing. What you want to achieve, and the goals that you set, will, of course, be different for each person. And they will change, and be flexible, according to your life-situation, the number of jobs and responsibilities you have at any time, the state of your health and the health of those closest to you, and depending on your economic situation. All these variables need to be taken into account, so, I think, a longer time frame than 30 days is a good idea. When I started writing again, in about 2009, after a long period of not writing (for complicated reasons, some of which I’m still not sure about, or understand) my first goal was simply to write every day. I didn’t set myself a word limit or a time limit, it was never about word-counting or clock-watching, but about respecting my writing self enough to pay her attention, every single day. 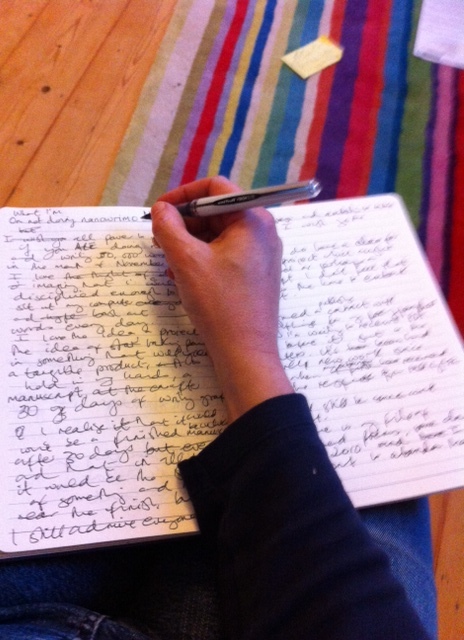 Once I’d decided that this was something I wanted to do and once I’d recognised that doing this made me deeply happy, certainly happier than when I hadn’t been writing, I found that time was available, every day, to write. It meant that I stopped doing other activities in order to create time. For instance, I stopped watching most television programmes; going out for meals unless it was for a really special occasion; buying and reading a newspaper every day – instead, I select articles from newspapers to read online; browsing in charity shops for books (I still do this occasionally but just not as often as I used to). I stopped doing all sorts of things which I’d somehow got into the habit of doing to fill my time. So giving them up wasn’t a sacrifice. If I’d felt unhappy about any of the changes I made, I’d have known that writing wasn’t that important to me. What made it easier to achieve my goal of writing every day was a deeper understanding, and acceptance, of how much I need to write. Once I’d established a routine of writing every day, I began to think about what I wanted to do with my writing, and to question why I was doing this. Was it enough for me to finish a poem and leave it sitting in a file on my computer? I decided that it wasn’t. For whatever reason, I wanted to share what I’d written with others. And it wasn’t enough for me to publish my poems on my own blog, I wanted someone else to read my work and make a critical decision about whether they liked it enough to publish it. I asked myself what I wanted beyond being published in an online zine or in a print magazine, and answered that I wanted my poems published as a collection. So I was clear in my mind about what I wanted, and I kept my goal in my head, I didn’t really tell people about it, or talk about it (not much, in any case). I wrote lists to myself, New Year’s Resolutions, Plans for the Week, Plans for the Month, and I carried on reading and writing. I went on writing courses, I attended writing workshops, and I wrote every day. I knew that in order to publish a book of poetry (be it pamphlet or full collection), I would first have to build up a record of publication, so I set about trying to achieve this by submitting my work to magazines and competitions. I didn’t know how long it would take. I thought, at least two years (bless my naivety). Here I am, five years later, and just about to have a pamphlet published. It feels good – I’m even allowing myself to start to feel just a little excited – but it doesn’t feel like the end of any road. It’s an achievement (or it will be, once the book is in my hands!) but, in the whole scheme of Life, the Universe, and Everything, it’s a very small achievement. I suppose what I’m saying is, good for you if you’re doing #nanowrimo and Good Luck. If you’re not, don’t beat yourself up, just set yourself achievable goals, start today, carry on tomorrow, and keep going, especially if it makes you happy. Celebrate each achievement, then move on. Set yourself another achievable goal. Keep achieving your goals. Small steps are good. My goals for next week are all to do with paying attention to my unfinished poems and finishing at least one. I’ll let you know how I get on. Have a great week, whatever you’re up to! ‘The Misplaced House’ to be published on November 30th. London launch December 8th. Thank-you for this post. I find it reassuring and refreshing. Good post, full of writing truths, and hurray for your pamphlet! I still haven’t decided whether to “do NaNo” this year — I’m super-busy with work and family commitments, but also have a book idea and really relish the thought of digging in — and maybe NaNo would be the ideal spur. I have a feeling that, this week being what it is, my personal NaNo will run from mid November to mid December, which I’m sure won’t give me a pretty graph by 30 Nov, but I might still achieve what I need. Either way, I’ll be dipping in to see how everyone else is doing — I love it; such good fun! I’d love to do it but deep down I know I’d have no chance of giving it the time it needs! Perhaps I will do my own inverted NaNoWriMo – 30 words a day for 1666 days! Mind you, even then I think I’ll struggle! Great post and good luck with the poetry pamphlet. Saving the article to read later but I really like that advice, Chris, thanks! Writing every day is good advice, yes… and I think I sometimes forget that means writing SOMETHING rather than writing a finished thing. Even commenting on blogs is writing, isn’t it? 🙂 And I think you’re right about not setting oneself up to fail. I’m also learning that poetry goals take a long time to achieve, but yours is an inspirational story. Having to curb my natural impatience is one of THE hardest things. You’re welcome, Vera! 🙂 How about you, did you go for #nanowrimo? You seem like a very focussed person, judging by your Twitter feed and blog. Well, I admire your energy!